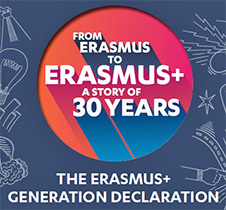 Reflecting on 30 years of mobility under Erasmus+, the Erasmus+ Generation has put forward 30 concrete proposals on the future of the Erasmus+ programme beyond 2020. They have high hopes for the future: a larger, simplified and more ambitious Erasmus+ programme that will not only help Europe tackle the most pressing societal challenges, but also bridge the skills gap, increase civic engagement; shape society around shared values; reach out to the most disadvantaged; and foster cooperation with the rest of the world. The proposals are based on the ideas poured into the Erasmus+ Generation Online Meeting Point, where thousands of former Erasmus+ participants were active in September and October 2017. This entry was posted in General on 15. January 2018 by Heckeberg.